Intel has unveiled its recent generation of Core processors, as expected. The desktop versions of Intel's latest and greatest offer improved efficiency and, of course, performance. The unlocked K series got three new CPUs, Core i9-9900K, i7-9700K and i5-9600K. 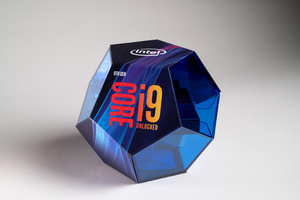 The octacore Core i9-9900K is the top of the line overclocking beast with sixteen threads, clocking in at 3.6 GHz with Turbo at 5.0 GHz. Core i7-9700K offers the same base clock speed at 3.6 GHz, with a tad slower 4.9 GHz Turbo, and has eight threads. The most affordable of the 9th gen unlocked CPUs is the i5-9500K with six thread computing and 3.7 GHz clock speed with 4.6 GHz Turbo mode. Prices start at $488 for the top specced i9, at $374 for the i7-9700K, and at $262 for the cheapest of the 9th gen K series chip. The new K series is compatible with previous 300 series chipsets but the company also revealed a new Z390 chipset which includes support for both 802.11ac Wi-Fi, or as we call it now Wi-Fi 5, and USB 3.1 gen 2 which offers speeds up to 10Gb/s. When it comes to the new X series CPUs, Intel had a total of seven new offerings to show off. They range from eight cores and 16 threads all the way up to 18 cores and 36 threads. Obviously you'll have to shell out quite a bit more cash for these ones. If you want extreme gaming performance, these X series chips are probably for you. They start at $589 with the new Core i7-9800X and if you want the best of the best, 18-core/36-thread Core i9-9980XE, you'll pay an estimated $1,979. The other five i9 X series CPUs fit neatly between those two prices.